Last major update issued on December 27, 2004 at 03:25 UTC. The geomagnetic field was quiet to unsettled on December 26. Solar wind speed ranged between 470 and 558 km/sec under the influence of a high speed stream from coronal hole CH135. Solar flux measured at 20h UTC on 2.8 GHz was 91.7. The planetary A index was 10 (STAR Ap - based on the mean of three hour interval ap indices: 9.9). Three hour interval K indices: 33222322 (planetary), 33231222 (Boulder). Region 10713 decayed slowly and was mostly quiet. [S491] A new unipolar region emerged in the southeast quadrant on December 26. Location at midnight S16E15. 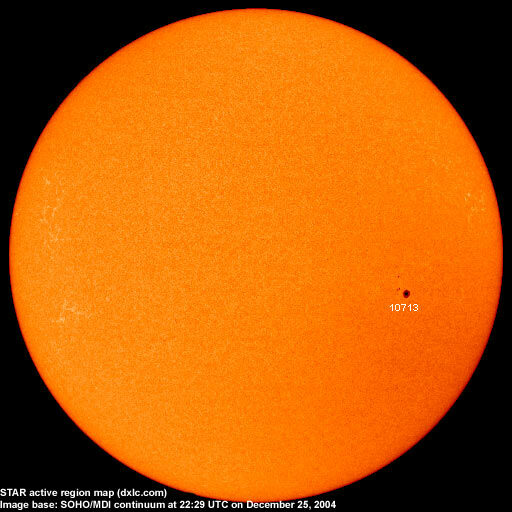 December 25-26: No obviously Earth directed CMEs observed. December 24: A partial halo CME covering the entire east limb and the south pole was observed in LASCO C3 images after 16h UTC. With a data gap in LASCO images after the CMEs observed in the morning and this CME, it is difficult to state if this CME was actually a continuation of the CME then observed off of the southeast limb or a separate event. If it was a separate event (the most likely possibility), its source would have been behind the southeast limb. A recurrent coronal hole (CH135) in the northern hemisphere was in a geoeffective position on December 23-24. Processed SOHO/EIT 284 image at 18:03 UTC on December 11. The darkest areas on the solar disk are likely coronal holes. 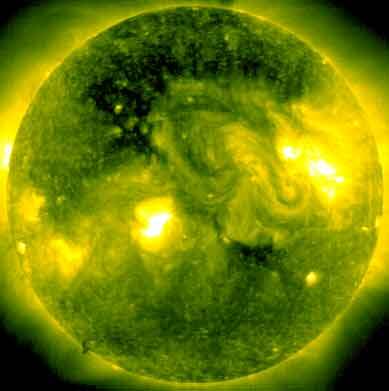 The geomagnetic field is expected to be quiet to unsettled on December 27. Quiet conditions are likely on December 28-30. Long distance low and medium frequency (below 2 MHz) propagation along east-west paths over high and upper middle latitudes is fair. Propagation along long distance north-south paths is poor. Trans Atlantic propagation conditions are normally monitored every night on 1470 kHz. Dominant stations tonight: WLAM Lewiston ME. Propagation was best towards the northeastern parts of the USA and Canada. During the local morning opening on December 26 propagation was best on the lower frequencies with CHLN Trois Rivieres noted on 560 kHz, CHNC New Carlisle and CKTB St.Catherines on 610 kHz. WJR Detroit on 760 and WWL New Orleans on 870 kHz both had good signals.